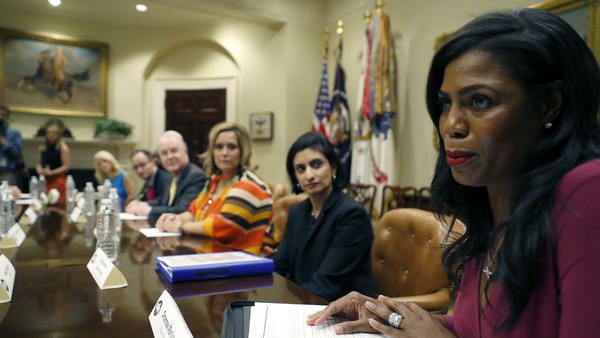 White House aide Omarosa Manigault speaks to a health care panel in June. On Friday, she was part of a panel at a black journalists conference that ended with the audience protesting her participation. A panel at the 2017 National Association of Black Journalists conference in New Orleans featuring White House aide Omarosa Manigault quickly went south after Manigault refused to answer questions about the administration in which she serves. The panel made news before it even started, according to Page Six, which reported that Nikole Hannah-Jones of The New York Times and Jelani Cobb of The New Yorker refused to take part in the panel after they were informed they would be on stage with Manigault. "Cobb told Page Six that the reason for pulling out 'wasn't simply the addition of Omarosa. It was that she was added at the eleventh hour and it was unclear whether we would be able to discuss substantive issues regarding the administration and its policing policies. Also, the panel was very disorganized, and basic things like format were not clear.'" Moderator and broadcast journalist Ed Gordon stepped in at the last minute, but he sparred with Manigault almost as soon as she stepped on stage. "Shame on you," Manigault told Gordon just minutes after coming on stage. At one point, Gordon and Manigault both stood and paced the stage, talking each other down face to face. "Let me tell my story," Manigault told Gordon. "Ask me a question about me." When asked about President Trump's recent comments that police should rough up people they are detaining, Manigault said his comments were wrong. She said issues of police brutality are important to the Trump White House. But said she could not elaborate on private conversations with the president. "You don't walk away from the table," Manigault responded when asked why she had taken a job in an administration seen by many in the room as hostile to African-Americans. "Because if you're not on the table, you're on the menu," she said. When asked about her work with the Department of Justice on policing issues, Manigault responded, "Google me." The crowd became increasingly angered with Manigault's seeming refusal to answer questions about the Trump administration. She said she was there to talk about her personal experience with violence, as some of her family members have been killed. Several conference attendees in the audience stood with their backs turned to Manigault, while others just walked out. Sarah Glover, president of NABJ, tried to take control of the panel after some 45 minutes of confrontation on the stage. But while she urged the audience to be calm and look at all sides of the issues and hear contrasting viewpoints, Manigault silently ducked off stage and whisked away by her security detail.